I want to thank everyone who commented on my previous post. There’s something very humbling about having people open up to you and express themselves. 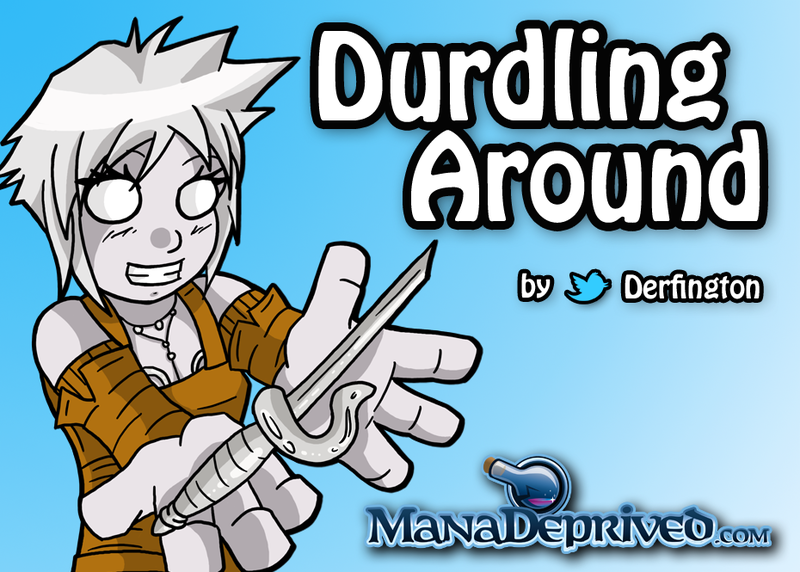 Everyone who commented will be getting some of my new Durdling Around stickers – which should be in production as we speak! Check it out on the right. I will be in touch with you all to get your addresses. These past couple thought exercises have helped me understand the #Vorthos side of things much better than before – and that’s all I really wanted. I’ll likely feel the urge to write again about #Vorthos in the future, but for the time being, I think I’ve #Vorthos-ed myself out. This may be news to people who don’t talk to me that often, but I’m no longer doing card alter commissions. When I first got into altering in 2011, it was a brand new venture that gave me a lot more room to express myself, and subsequently, receive more exposure online. Considering I have only done two alters in the past 6 months, it is safe to say I have not kept up with the times, and it is probably also safe to say that I have little free time left to devote to altering. It’s been a wonderful experience, but there are much better alter artists out there these days, and it’s probably best for me to move onto new things. Thank you to all my past clients for their patronage. Darn, what a shame, I never got to get anything altered by you 😦 ah well none the less, all the alters of your I saw were fantastic. Maybe sometime in the future you will get back into it. Keep up the fantastic work with Durdling Around, and best of luck in your future endeavors.